From Spanish carbonada (“carbonized”) (from carbonar (“to carbonize”)) + -ado (suffix forming past participles of regular verbs ending in -ar). Carbonada appears to have been modelled after Italian carbonata (“coal pile; stew of beef in red wine”), from carbone (“coal; charcoal”) (from Latin carbō (“coal; charcoal”), from Proto-Indo-European *ker- (“to burn”)) + -ata. The verb is derived from the noun. (cooking, dated) Meat or fish that has been scored and broiled. Take it vp Villain, and eat it, or I will make thee ſlice the brawnes of thy armes into carbonadoes, and eat them. [T]o ſay the Troth on't before Corioles, he ſcotcht him, and notcht him like a Carbinado. Our giants again found their way to the larder, and broke theirfast with collops, rashers, carbonados, a shield of brawn and mustard, and a noble sirloin of beef, making sad havoc with the latter, and washing down the viands with copious draughts of humming ale. The carbonadoes consisted of any meat scotched on both sides and sprinkled with seasonings in various combinations, and then either broiled over the fire or before it. With a quick sweep of my eye, I see fricassées, steamed bass and poached salmon, roast snipe, peacock, teal, mallard and quail, game pies and carbonados, tarts of marrowbone, neats' tongues, venison pasties, baked guinea fowl, compound salads, dishes of cream, quinces, comfits and marzipans, preserves, cheeses and fruits. (transitive, dated, also figuratively) To make a carbonado of; to score and broil. Has he beſpoke, what will he have a brace, / Or but one Partridge, or a ſhort-leg'd Hen, / Daintyly carbonado'd? (transitive, obsolete) To cut or hack, as in combat. Draw your sword, you rascal. You bring letters against the King, and take the side of his vain daughter against the royalty of her father. Draw your sword, you rogue, or I'll cut your thighs. In Moscow, a Count carbonadoes / His ignorant serfs with the knout; / […] / But Eton has crueller terrors / Than these,—in the Windsor Express. Borrowed from Portuguese carbonado (“carbonized”), probably from carbono (“carbon”) (currently only attested later than carbonado) + -ado (suffix forming adjectives from nouns meaning ‘something or someone who has suffered the action’). Carbono is borrowed from French carbone (“carbon”), from Latin carbō (“coal; charcoal”); for further derivation, see etymology 1. (mineralogy) A dark, non-transparent, impure form of polycrystalline diamond (also containing graphite and amorphous carbon) used in drilling. At present, equal attention is paid to irregular fragments of a blackish or greyish colour, occasionally of considerable size, also yielded by the washings of diamandiferous sand, which formerly passed unregarded. These fragments are now carefully colected, and have acquired some considerable value in commerce, where they are known under the name of carbonado or carbon. […] An examination of these numerous varieties has made it evident that between carbonado of a simply micro-crystalline texture, and the diamond regularly crystallised in diaphanous octahedrons, there exists an uninterrupted series of intermediate conditions. Brazil's carbonadoes are indispensable today for the speedy cutting of hard rubber, bakelite and fiber compounds. Their absolute precision is especially valuable in turning such instruments as high-power telescopes and microscope tubes. Carbonado, the granular variety of diamond, is a porous micro- or cryptocrystalline aggregate, composed of anhedral grains and crystallites of octahedral or, less commonly, cubic habit that range in size from 0.5 to 50 nm. Carbonados are polycrystalline diamond aggregates of generally irregular shapes that have been observed in placer deposits and low-grade metamorphic rocks of mainly Brazil, Russia, South Africa, Ukraine, Venezuela, and the Central African Republic. […] Smith and Dawson (1985), consequently, suggested that carbonados could have been formed as a consequence of Precambrian impact events into carbon-bearing crustal rocks. All other traces of these impacts and the related impact structures apparently have been eroded, and only the carbonados had survived erosion and were then incorporated into sedimentary rocks. ^ “carbonado, n.1”, in OED Online ⁠ , Oxford: Oxford University Press, December 2008. ^ “carbonado, v.”, in OED Online ⁠ , Oxford: Oxford University Press, December 2008. ^ “carbonado, n.2”, in OED Online ⁠ , Oxford: Oxford University Press, December 2008; “carbonado” (US) / “carbonado” (UK) in Oxford Dictionaries, Oxford University Press. 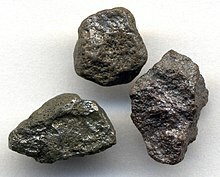 “Carbonado” in David Barthelmy, Webmineral Mineralogy Database , 1997–. “carbonado”, in Mindat.org ‎, Hudson Institute of Mineralogy, accessed 10 October 2018. Masculine singular past participle of carbonar. This page was last edited on 13 March 2019, at 03:27.